Home / Culture / Chile’s Shopping Malls and Chileans Love of "Shopping"
Chile’s Shopping Malls and Chileans Love of "Shopping"
Chileans have adopted many words from the English language to describe the world around them. Shopping malls are a great example of this trend. 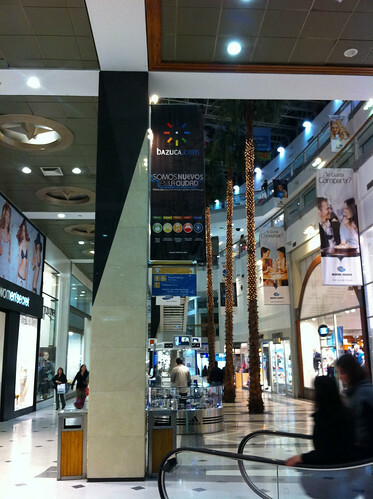 “Shopping” and “Mall” are both terms that Chileans use to describe the classic large shopping mall. These are the large, indoor malls that have big anchor stores like Ripley, Fallabella, or Paris with smaller shops in between. Chileans pronounce “shopping” more like “chop-ing”. “Mall” comes out more like “maul” or “moll”. So even though it is spelled in the English format, it might not sound that way. This is typical of English words that have been adopted into Chilean vocabulary; they are pronounced as if they were Spanish. “Shopping” and “Malls” are popping up all over the place. In Santiago, you’ll find large mall complexes right down the street from each other. A favorite Saturday activity for Chileans is to go to the mall and eat at the patio de comida or food court. These food courts house many of the typical fast food restaurants you’d find in the United States: McDonald’s, Burger King, Kentucky Fried Chicken, and others. 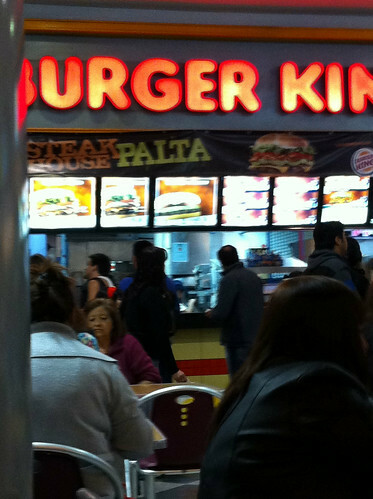 Below is a picture of the Burger King at a shopping mall’s food court in Viña del Mar. Notice the “Steak House Palta” banner, touting that you can get your steak burger with the favorite Chilean topping: avocado. Side by side with these international giants, you’ll find local Chilean fast food places like Lomiton’s that serves delicious lomitos or Fritz where you can also get Chilean food with German flair. Chilean malls, like their gringo counterparts, often house large movie theaters. New releases are typically in English with Spanish subtitles. However, you’ll also find dubbed movies and movies from the blossoming domestic Chilean film industry. Malls are typically very busy and packed with roving groups of teenagers. Both of these seem to be global trends. pretty nice job describing the chilean shopping bud, really makes me wanna move back home right now ( i’m chilean ) and well keep up the good job and i hope to see more of this. @Nicolas – Thanks! I know I did a good job if it makes a Chilean home sick. U make Chile sound like the 3rd world Costa Rica where it’s supposed to be an advancement getting Kfc an McCraps. Chile is supposed to be more advanced. Mall is pronounced “mole” in Costa Rica because “mal” means bad which would be the real pronunciation. @Mara – You’re right: Chile is very modern. I don’t recommend that anyone visiting Chile actually eat at KFC or McD’s. Everyone should try some traditional Chilean food instead. Eating in American restaurants or fast-food places is a novelty in any country outside the US. McDonald’s are packed in London, Paris, Madrid… you name it. In Paris, there is one close to the Arc of Triumph, one of the ritziest parts of the city and it is always packed. All Pepe did was show a picture of a Burger King in Viña, which is actually there. It is not suffering from lack of business which is provided by us Chileans. It’s got nothing to do with the 1st, 2d. or 3d. world. The Spanitized English words used in Chile are due to it being a Spanish speaking country… nothing else. Notice Costa Rica is comparable to Chile. In all, not a bad record and not all that different from Chile’s. All this information is readily available in WikiPedia.